Pop-Tarts: Hate to love them or love to hate them? Another food fad remake struck the foodie world in the past few years: The often reviled Pop-Tart, an American breakfast icon, has experienced a renaissance of sorts in bakeries and restaurants. In the Washington, D.C. area, knowing foodies sample homemade “poptarts” at Ted’s Bulletin and Northside Social, among other places. These eateries have put their own spin – from bacon peanut butter to old-fashioned apple, on the toaster pastry, known to most as the Kellogg’s Pop-Tart. But why the Pop-Tart? More importantly, to all those haters, why NOT the Pop-Tart? Ask anyone who grew up in the United States (or has raised children here) about Pop-Tarts, and you’ll almost certainly see an emotional response. People tend to either love them or hate them. Even Jerry Seinfeld offered his opinions during a very funny bit on a recent tour, saying, “When they invented the Pop-Tart, it blew the back of my head off…it was the ’60s, we had toast!” For anyone raised on bland, low-sugar breakfast staples, Pop-Tarts brought Wizard of Oz Technicolor to our world of black-and-white. As Seinfeld joked, “The people who invented [Pop-Tarts] must have come out of the lab like Moses with the tablets with the Ten Commandments.” Who cares that they bear little resemblance to any actual fruit or pastry when they’re that novel – though I personally think calling it a pastry is a bit of an insult to pastries everywhere. It’s like calling shortening-based Cool Wip whipped cream. That brings me to the haters. I certainly understand their viewpoint, but I respectfully disagree. I have had a lifelong love affair with Pop-Tarts. I can’t remember The First Time – when Pop-Tart and I met, but right away I knew I found my breakfast One (ok, so maybe not compared with a chocolate croissant, but I was probably four or five years old). 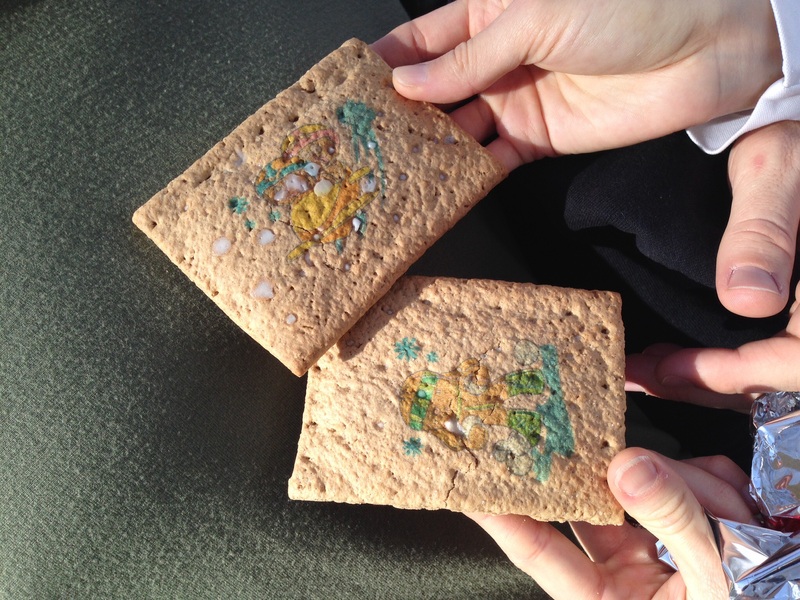 Pop-Tarts were an oh so bad, oh so good breakfast indulgence reserved, in my family, for vacation at the beach. So maybe for me it wasn’t so much the Kellogg’s Pop-Tart itself, but the association with my beloved ocean, sand, and sun. Regardless, I relished the pastries I always ate them unheated, nibbling off all four sides of the crust first, saving the delicious interior for last. Initially, the frosted varieties were banned completely (FD&C Red 40 anyone? Why add even more sugar to the sugar bomb? ), but it became increasingly difficult to find the unfrosted ones, and so I met my Pop-Tart match: Frosted Cherry. For years as a kid, the Frosted Chocolate Vanilla Fudge trumped the cherry, but eventually, the cherry ousted the choc-vanilla as number one. The sweet and tart cherry filling drowns the usually lackluster crust, and the sugar sprinkles add a nice texture. Remaining in a not too distant second place are the chocolate with vanilla fudge filling. The vanilla filling has a bit of a marshmallow character without too much sweetness, and the chocolate crust doesn’t hurt, either. To this day, though, I crave cherry Pop-Tarts. No matter that I am an insane foodie with a penchant for healthy, natural food, I enjoy them once or twice a year when I’m willing to bear with the insulin shock. 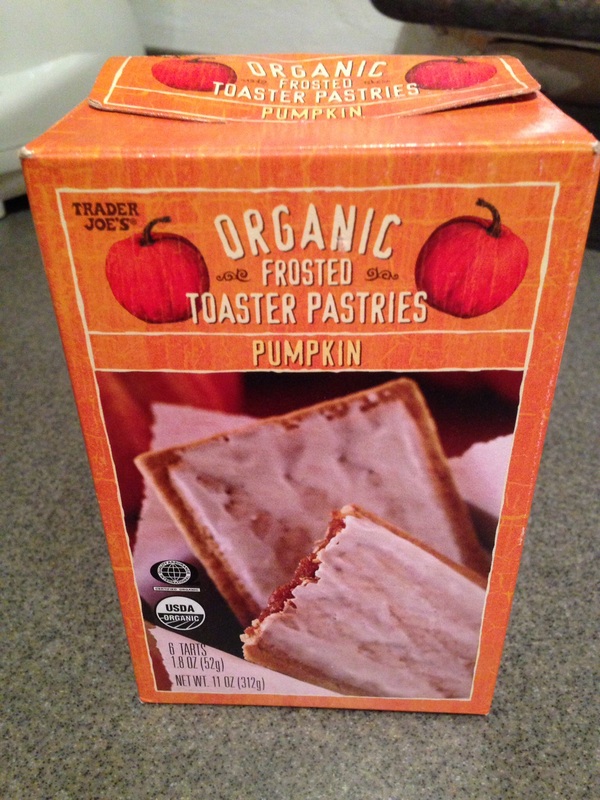 Trader Joe’s pumpkin toaster pastries. A for effort, B- for execution! Since my first early ’80s experience with Pop-Tarts, I’ve watched the genre expand, adding even more and more outrageous flavors, created from just as outrageously artificial, lab created ingredients, with colors to match: blue raspberry with purple and blue frosting to pro, chocolate cookie dough, low fat apple cinnamon, etc. In fact, while developing this post, I recently tried Limited Edition Kellogg’s Gingerbread Pop-Tarts and Trader Joe’s organic Frosted Pumpkin Toaster Pastries. I would rate the gingerbread a D and the pumpkin a B-. The gingerbread variety in no way resembled gingerbread or even nutmeg (a much better artificial rendition was Twix holiday gingerbread flavored cookie bars). The pumpkin version tasted more as advertised, but it still fell short of the original Kellogg’s Brown Sugar Cinnamon. Kellogg’s Gingerbread Pop-Tart. So they’ve made tattoos for food, which about matches the disappointing lack of gingerbread flavor. I had such high hopes! I’ve tried the off-brand versions and even a few of the homemade versions. I find the homemade versions to be fresher, more plump, softer to the bite than the original Kellogg’s and their manufactured knock-offs. The fillings have – gasp! – real fruit and often, natural ingredients. Overall, the eating experience feels more akin to a hand pie than the original Pop-Tart. So in this case, I applaud Ted’s Bulletin and others for their effort, creativity with flavors like peanut butter and bacon, but I have to say that you just can’t match the intensity and texture of the real Pop-Tart. I’m sure some of you are rolling your eyes. How can I stake a claim on foodie-ism and prefer a mass-produced, hydrogenated, flat, sugar bomb over an inspired, natural version? I do so because taste isn’t just about flavors – it is the eating experience. The nostalgaia. The memories and the flavors in concert. My mouth is watering already. Sigh, and I just broke into a four-month old packet. Yum! So what do YOU think? Pop-Tarts: Yay or nay? What was your favorite flavor? Homemade – better than the original? Share your own pop tart stories! Next Post What is Baltic cuisine?